Misconception of Data in public life. The misconception of dart from public life is really a huge problem for people wanting to create positive social change within our society. The Independent today has an interesting article on what the public (that’s us) misconceives information especially information about significant social data. 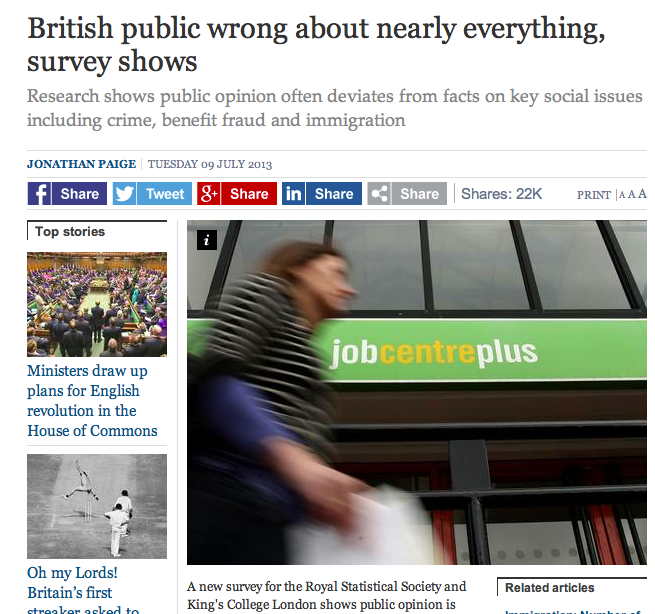 The article titled “British public wrong about nearly everything, survey” is well worth the read. This is something that photographers attempt to do when they’re creating images. However, some of the issues that are raised In this article in the Independent can only be addressed by the use of words and skilful application of photographic ‘truths’ to illustrate and highlight aspects of the social landscape. Photography can only ever a partial solution for the exploration of our social worlds.